One of the tools that legislature can use to further enhance oversight of the financial operations of Government is a specialized Committee. In the Westminster model of democracy the committee is known as the Public Accounts Committee (PAC). 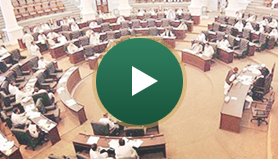 It is the Audit Committee of Parliament and as such is the core institution of public financial accountability established by Federal and Provincial Government to examine the accounts of Governments and their agencies. The Committee on Public Accounts enjoys the place of pride in our Committee System as this Committee is one of the tools that a legislature can use to further enhance oversight of the financial operation of Government. 2. The responsibilities of the PACs cover the area of oversight traditionally referred to as fiscal audits. Fiscal audits focus exclusively on the examination of Government expenditures to assure that funds appropriated by the parliament have been spent legally and as the parliament intended. 3. The structure and functions of the PAC date back to the reforms initiated, by William Gladstone, when he was British Chancellor of the Exchequer in the mid-19th century. The first PAC was established in 1861 by a Resolution of the British House of Commons which is replicated in virtually all Commonwealth Countries and many non-Commonwealth Countries. 4. The Committee on Public Accounts was first set up in 1921 in the wake of the Montague-Chelmsford Reforms. The Finance Member of the Executive Council was the Chairman of the Committee. The Secretariat assistance to the Committee was rendered by the Finance Department (now called the Ministry of Finance). The system continued up to 1949. This naturally restricted the free expression of views and criticism of the Executive. 6. Khyber Pakhtunkhwa has been a very unfortunate Province during British era, it was known as an unconstitutional land. In 1932 it was declared as Province and hence a separate Legislative Council came into being to run the affairs of Province. Under the Government of India Act 1935, enforced on 1st April, 1937, the legislative council was renamed as NWFP Legislative Assembly, Election for the NWFP Legislative Assembly were held in 1937. After creation of Pakistan in 1947 the then NWFP was retained as separate Province, parliamentary traditions were developing here, but unfortunately in 1955 all West Pakistan was declared as one Unit and NWFP was incorporated into it, hence it ceased to exist as a Provincial Assembly, so there was no question of PAC during that period. 7. In 1970 General Yahya Khan annulled one Unit and consequently four Provinces were restored, so the then NWFP again emerged as a Province with its own Provincial Assembly. 8. For the first time in history of elections were held for both Provincial and National Assemblies. The then NWFP Assembly took oath on 02/05/1972. However, there is no record of PAC available for that period. That Assembly was dissolved on 13/02/1977, after completion of its Constitutional tenure. New elections were held in 1977 but mean while General Zia-ul-Haq, imposed martial law and the Constitution of 1973, was held in abeyance. 10. The Committee met for the first time on 19th June, 1979 to lay down a procedure for the meetings to scrutinize and examine the accounts of the Government of NWFP for the financial year, 1970-71 and thereafter met for 79 working days and all accounts upto financial year, 1978-79 as received by the Committee, were finalized. 11. First Report of the Committee i.e. on the Appropriation Accounts, Finance Accounts, and the Audit Report on the Accounts of Govt. of NWFP for the financial years1970-71 to1978-79 was presented to the Governor, NWFP on 31st August, 1981 and was approved on 24th October, 1981. 12. The Committee then took up for consideration the Auditor General’s report on the accounts of Government of NWFP for the year 1979-80 discussed it in its 14 sittings held from 21-02-1982 to 03-04-1982, second Report of the Committee was presented to the Governor, NWFP and was approved on 13th June, 1982. 13. Third report of the Committee i.e. on, Finance Accounts, and the Audit Report on the Accounts of Govt. of NWFP for the financial years1980-81 & 1981-82 was discussed by the committee in 48 sitting and presented same to the Governor, on 18thMarch, 1985 and was approved on 20th March, 1985. 14. APAC was dissolved on 28/02/1985. 1. Raja Amanullah Khan, Speaker/Chairman. 16. The Committee held three series of meetings comprising (37) sittings, from 24/08/1986 to 04/09/1986 at Frontier House, Abbottabad, from 10/11/1986 to 24/11/1986 at Provincial Assembly of NWFP, from 01/04/1987 to 16/04/1987 at Provincial Assembly of NWFP, from 20/07/1987 to 23/07/1987 at Frontier House, Abbottabad and from 12/12/1987 to 27/12/1987, respectively. 17. This Committee discussed the Audit Report and Commercial Accounts for the years 1981-82 and 1982-83. The Committee also discussed the and Appropriation Accounts for the years 1983-84 & Audit Report and Appropriation Accounts for the year 1984-85. The report was adopted by the Assembly on 31/06/1987. 18. This Committee remained in function up to 29/05/1988 and ceased to work due to the dissolution of the Assembly. 20. It partially discussed the Audit Report for the year 1985-86, but the report could not be placed before the Assembly as the Assembly was dissolved on 06/08/1990. 22. The Committee took-up for discussion the Report for the year 1985-86, which was left incomplete by the earlier PAC. However, it also could not finalize the above report and once again the report could not be placed before the Assembly as Assembly was dissolved on 30/05/1993 and PAC ceased to exist. 24. The Public Accounts Committee held series of meetings at Kalam, Kund and Peshawar respectively. The Committee considered the Audit Report and the Appropriation Accounts for the said year within 30 working days w.e.f. 16/08/1994 to 11/10/1994. 25. This Committee partially discussed the Auditor General Report for the year 1989-90 which was adopted by the House on 25th October,1994. The Committee also discussed partially the Audit Report and Appropriation accounts for the year 1991-92, but could not finalize the whole report due to dissolution of the Assembly on 12/11/1996, hence PAC ceased to work. 27. Mr. Ali Afzal Khan Jadoon, was replaced by Syed Manzoor Hussain and Mian Gul Asfindiar Amirzeb was replaced by Mr. Muhammad Ayub Khan Afridi and Mr. Pir Muhammad Khan was replaced by Mr. Farid Khan Toofan, due to their induction into the Provincial Cabinet. 29. A series of meetings of PAC were held from 11/08/1998 to 17/09/1998 at Peshawar and Swat, spinning over (22) working days to discuss the Audit Report for the year 1995-96. The Report was adopted on 2nd July 1999. 30. Consequent upon the suspension/dissolution of the Provincial Assembly of NWFP and in view of proclamation order No. 2-10/99-Min-1 dated 14th October, 1999, 6th PAC ceased to function. In order to carry on the business of accountability and securitization of Auditor General Reports, the Governor NWFP, promulgated the NWFP Adhoc Public Accounts Committee, Composition and Functions Ordinance, 2000. 32. The committee could not start its function due to litigation in Court of Law. 34. The Committee in its first introductory meeting held on 15th of July 2002, decided to take up Report of Auditor General of for the year 1997-98, being the latest one. It finalized Report on Appropriation Accounts, Finance Accounts and Audit Report on Revenue Receipts of Government of NWFP in its Twenty Five sitting and presented the same to the Governor on 8th of October, 2002 for his approval. The same was approved by the Provincial Cabinet in its meeting held on 11th November, 2002. Thereafter, the Committee in its 18 days sitting, available with it, examined the Audit Report in respect of Local Government, Board of Revenue, Higher Education, Industries and Food Departments. Last meeting of the APAC was held on 27th November, 2002. The Committee could not completely discuss the Audit Report as it was dissolved on 23rd November, 2002 in view of the NWFP Adhoc Public Accounts Committee (Constitution and Function) (Repeal) Ordinance, 2002. 36. After the induction of Mr. Shah Raz Khan, Member of PAC in the Provincial Cabinet, he was replaced by Mr. Muzaffar Said, MPA as Member of PAC. 4. Agriculture, Livestock & Cooperation. 6. Environment. 7. Social Welfare & Women Development. 8. Home & Tribal Affairs. 38. In this lengthy process, the Committee disposed of 1375 Audit Paras and its report was adopted by the House on 28thJune, 2005. It also discussed Audit Report and a portion of Appropriation Accounts for the year 2001-2002. Report was adopted by the House on 29th June, 2007 and completely discussed the Auditor General’s Report on the Accounts of Govt. of NWFP for the year 2002-2003. Repot was prepared but could not be placed before the House due to dissolution of Assembly on 10/10/2007. 40. Due to sad demise of Late Alam Zeb, MPA/Member of PAC, he was replaced by Mr. Saqib Ullah Khan Chamkani, MPA as Member of PAC. 41. The Committee started its functions and firstly laid the report for the year 2002-03 which was discussed by the earlier PAC , the report was adopted by the House on 21/01/2009. The Committee then took-up for consideration the Audit Report, Appropriation Accounts, Finance Accounts, Audit Report on Revenue Receipts, Commercial Accounts for year 2003-04 and 2004-05 and the Audit report for the year 2005-06 discussed it completely. The report for the year 2003-04 was finalized and adopted by the House on 30/09/2009 and preparation of the report for the year 2004-005 and 2005-06 was in progress till finalization of this booklet.